Brad Stevens said Aron Baynes has a Grade 2 ankle sprain. If it’s a similar timeline for Baynes, it still pushes him close to start of playoffs. After the game, head coach Brad Stevens told reporters after the game Baynes was diagnosed with a Grade 2 ankle sprain. Stevens was unable to provide a timeline for the big man, but a quick Google search says that a Grade 2 ankle sprain could take up to 6-8 weeks to recover. 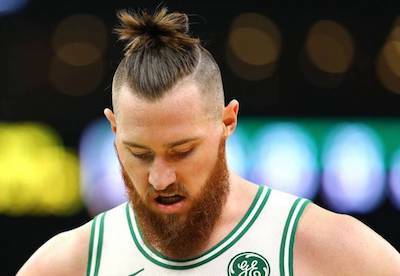 Aron Baynes is one tough guy on the court, but he's been rather fragile when it comes to injuries this season and suffered another major one with this Grade 2 ankle sprain in the loss to Philly Wednesday night. Looks like we might not be seeing "All of Australia" again until the playoffs and possibly not until the 2nd or 3rd round. Baynes' loss was felt tonight and the Celtics will need him healthy if they want to make a deep run in the playoffs. Daniel Theis and Robert Williams will have to step up the rest of the regular season, so that the C's don't burn out Al Horford. Thomas Robinson also could be added for big man depth. Aron Baynes has what the team terms a Grade 2 sprain of his left ankle. No timetable given. Only 10 games left in regular season.